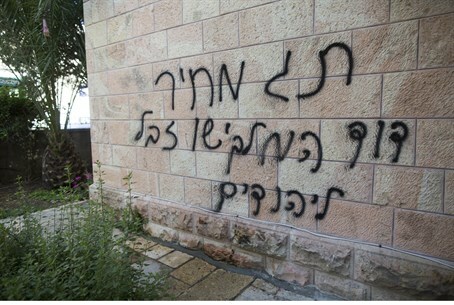 Two youths, one 16-years-old, charged for vandalism in Yokneam, an Arab Druze town in the north. Two Jewish youths have been charged with "price tag" vandalism on Arab-owned property, the Justice Ministry said Thursday. A 16-year-old arrested earlier this month on suspicions of scrawling graffiti on and smashing the door and windows of a Druze dentist's practice in Yokneam, a town in northern Israel, was charged on Thursday, the ministry said. The minor's name was not made public, in accordance with Israeli law. On Wednesday, prosecutors filed charges against Adir Yosef, 26, for allegedly damaging an Arab-owned car in Yokneam earlier in May. According to the charge sheet, 14 "price tag" incidents have occurred around Yokneam in the past three months. Some have accused the police of overreacting to the wave of reported "price tag" crimes. An Arutz Sheva report in January revealed that in at least some of the cases, anti-Arab "price tags" were being systematically staged by Arab activists.